A lot has been written about economic inequality as measured by distribution of income, wealth, capital gains, etc. In previous posts such as Inequality, Lorenz-Curves and Gini-Index or Visualizing Inequality we looked at various market inequalities (market share and capitalization, donations, etc.) and their respective Gini coefficients. 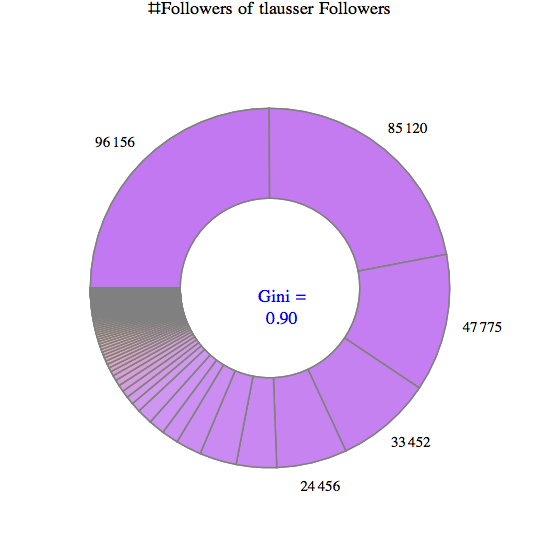 Of 107 followers, the top 5 have ~75% of all followers that can be reached in two steps. The corresponding Gini index of 0.90 is an example of extreme inequality. From an advertising perspective, you would want to focus mostly on getting these 5% to react to your message (i.e. retweet). In a chart with linear scale the bottom half does barely register. 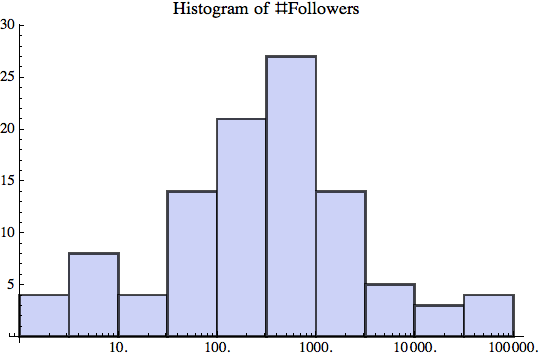 Most of my followers have between 100-1000 followers themselves, as can be seen from this log-scale Histogram. What kind of distribution is the number of followers? 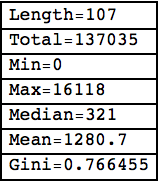 It seems that Log[x] is roughly normal distributed. 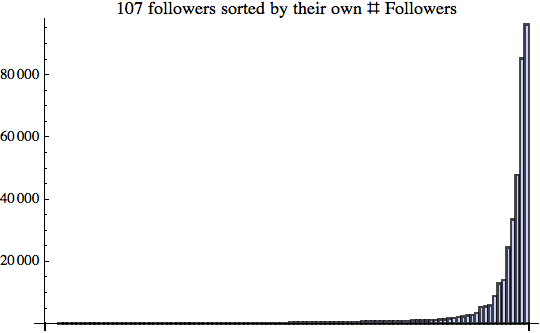 As for participation inequality, let’s look at the number of tweets that those (107) followers send out. Some of them have not tweeted anything, the chattiest has sent more than 16,000 tweets. 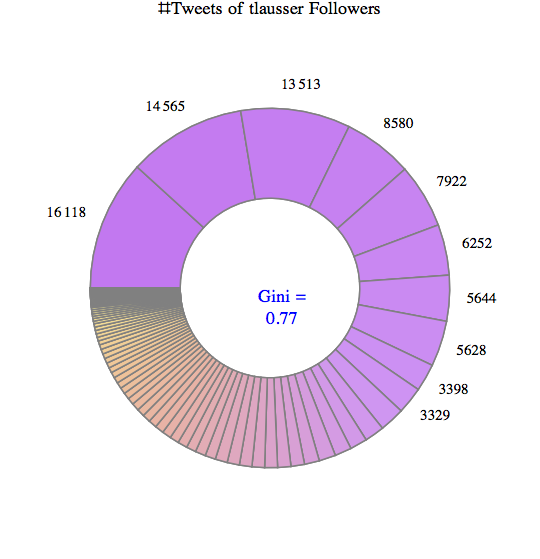 On average, each follower has 1280 tweets; the total of 137,000 tweets is again highly unequally distributed for a Gini index of 0.77. The top 10 make up about 2/3 of the entire conversation. 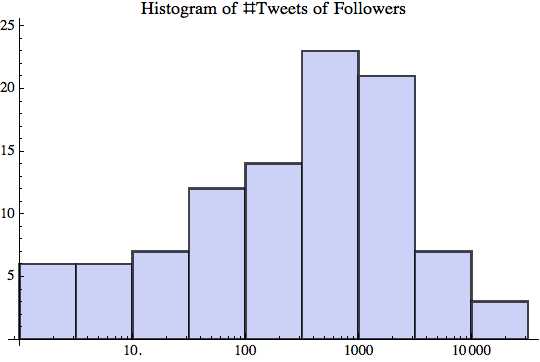 These preliminary results indicate that there are high degrees of inequality regarding the number of tweets people send out and even more so regarding the number of followers they accumulate. How many tweets Twitter users send out over time is more evenly distributed. How many followers they get is less evenly distributed and thus leads to extremely high degrees of inequality. I presume this is caused in part due to preferential attachment as described in Barabasi’s book “Linked: The new science of networks“. Like with all forms of attention, who people follow depends a lot on who others are following. 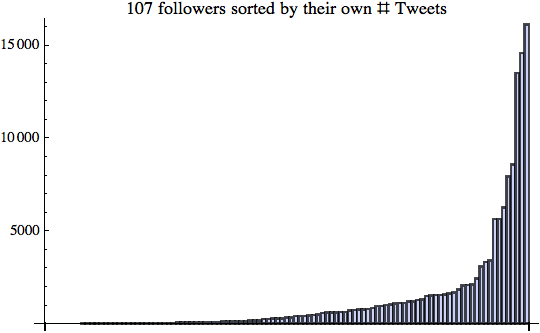 There is a very long tail of small numbers of followers for the vast majority of Twitter users. That said, the degree of participation inequality I found was lower than the 90-9-1 rule, which corresponds to an extreme Gini index of about 0.96. Perhaps that’s a sign of the Twitter community having evolved over time? Or perhaps just a sign of my analysis sample being too small and not representative of the larger Twitterverse. In some way these new media are refreshing as they allow almost anyone to publish their thoughts. However, it’s also true that almost all of those users remain in relative obscurity and only a very small minority gets the lion share of all attention. If you think economic inequality is too high, keep in mind that attention inequality is far higher. Both are impacting the policy debate in interesting ways.